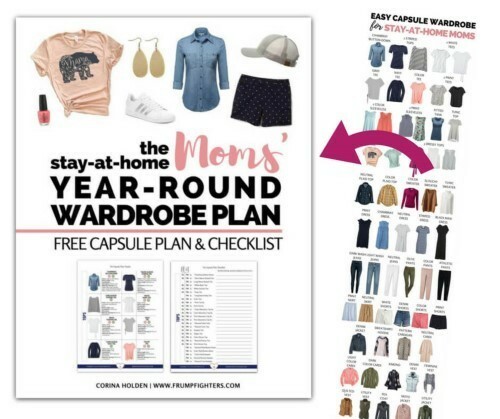 The 2019 Stay at Home Mom Capsule Wardrobe Plan is a free download that shows you all the best clothes for moms to achieve those stylish mom looks that you see all over Pinterest. No fashion sense required! Download your copy for free below. If you’re new to the “capsule wardrobe plan” solution, please read on. Here’s what you’ll find in this blog post. Fashion tips for looking stylish are helpful, but clothes shopping can still feel ambiguous, overwhelming, and expensive when you’re not a natural with fashion. There are just SO MANY OPTIONS out there. As a new stay-at-home mom, I just wanted someone to tell me how I could achieve that effortless cute mom look. How did trendy and casual style meet to create a Joanna-Gaines-style casual wardrobe? Those mamas that had nailed it… they looked so comfortable and yet adorable! I didn’t want to waste money on clothes that felt foreign to me. But I also wanted to get out of my boring clothes rut. And I couldn’t find this kind of complete done-for-you guide of what wardrobe essentials I should focus on to achieve cute “mom on the go” outfits every day. There were tons of capsule wardrobes out there, but none were mom-friendly and budget-friendly. So, 6 months into blogging about mom-friendly fashion I knew what I really needed to finally beat the “frumpy mom” look for good. I needed to create my own mom wardrobe guide. I sat down to research and plan my first stay at home mom capsule wardrobe planner in fall of 2016. I figured that even if you worked outside the home, it was the at-home, casual style that was the real challenge since it was too easy to default to frumpy and boring. When the fall capsule plan totally took off on Pinterest I knew I wasn’t the only mom finding this helpful! A winter and spring/summer capsule continued to be a huge help so last year I decided to bring all of them together to create a year-round mom capsule. Having the whole year planned out together proved to save all of us lots of time and money because we could plan ahead and give ourselves plenty of time to find the exact items we still needed to round out our wardrobes. The best part? It’s an incredible boost to our CONFIDENCE. There is no fashion sense or experience required to create a cute mom wardrobe when you follow a plan that someone else has already researched thoroughly. And the way it explodes the outfit options for cute on-the-go looks every day… well that’s my favorite part! It takes dozens of hours to research and compile a perfect capsule wardrobe planner, so if I was just doing it for myself I don’t think it would be worth it. But it’s 100% worth it when I share it with thousands of other moms, saving us ALL tons of hours and dollars! I’m so excited to share the result of my latest research and curation on the best clothing pieces to create a flexible but stylish mom wardrobe that we can enjoy all year round! Download the complete PDF printable to get shopping links and notes about what to look for with each item, printable shopping checklist, and 8 cute mom outfit ideas covering each season. This stay at home mom capsule plan covers an entire year of wardrobe needs. Don’t be scared off by the idea of a “capsule.” It’s totally just the framework I use to simplify things, but you can have as much added variety within each category as you’d like. The wardrobe size you end up with is totally flexible! If the list above seems like a lot of pieces, remember this is for the entire year: fall, winter, spring, and summer. I make a point to mark the very basic essentials with an asterisk (*) so that you can focus your shopping list if you are just getting started. The structure of last year’s full year wardrobe is still solid, so this year’s update simply offers a few enhancements and an overall fresh feel that is 100% relevant but still not too trendy. These updates are all based on the results from the survey I sent out as well as just general feedback in the Facebook group! Thank you everyone for providing that!! I also created a more detailed chart that specifically shows you EVERY change in the pieces. Most of the updates are in how I labeled items, but the items remain the same. I didn't really remove any pieces, but a few are swapped for a similar alternative. For example, a straw hat was swapped for a baseball cap. There are 6 new pieces. Are you wanting to pare down your clothes to create a minimalist mom capsule wardrobe? Or maybe you’re a brand-new mom finding your previous wardrobe to be useless? Or you’re pregnant or nursing and need a list of wardrobe staples to purchase? In either case, this will apply to you. I’ll share the process I’ve developed to freshen up your wardrobe starting with what you already own. I follow these steps every 6 months or so when spring/summer or fall/winter is around the corner. It keeps my wardrobe de-cluttered and relevant so that cute mom outfits are readily available. The key to a simplified wardrobe is making sure all the pieces are “remixable” (easy to mix and match). 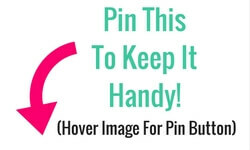 This allows you to have fewer pieces and yet create more variation in your daily looks. Because it can take a lot of trial and error to figure this out for yourself, I do all the leg work with the capsule wardrobe plan for SAHMs. All you need to do is download the plan (below), plan a kid’s nap time or bedtime to have some time to yourself, and then walk through the steps in the next section. These steps use the free Stay At Home Moms’ Year-Round Wardrobe Plan, so make sure you’ve had it sent to your inbox. Go through all your clothes (hanging, folded, in hamper-jail) and place just your favorite pieces on the bed. These are pieces that fit you well, are in good condition, and you find yourself going back to over and over. Might use in the future/unsure -> Archive by storing in a bin or a spare closet. Set a reminder on your phone to reassess these items in 3 months. Place your favorite pieces back in your closet/drawers. 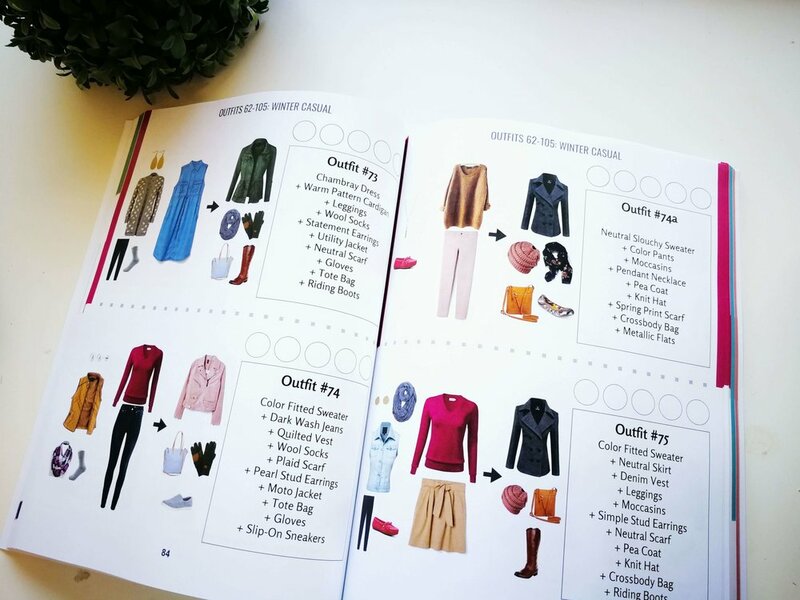 If you haven’t already, go ahead download and print out the capsule wardrobe booklet (above). To save on ink, you can just print the capsule plan checklist. These same steps are written out on the first few pages so you can print them off to reference away from your computer too. Customize Pieces. Take a look at the suggested pieces on the visuals page. If you find that something wouldn’t work for your style or body shape, you swap out any pieces for something similar that you prefer! Scribble and make notes about anything you want to swap. Now take the visuals and checklist and go through your freshly de-cluttered closet. Check off items you have. You do not need to have the exact pieces. Follow the criteria I’ve used within the of label each piece. For example: “Neutral Tunic Top” means it should be a tunic length top in a solid neutral color from the color palette you planned. Beyond these specifications your pieces can vary from the example pieces and still achieve remixability. Step 5: Shop For What’s Left. Anything left unchecked on your checklist becomes your shopping list! Easy right? To make shopping go quickly, take a moment to specify what colors you’re aiming to find for each item. It makes it easier to browse the images online and racks in-store. It’s hard to get out shopping with kids in tow! I do most of my shopping online and stick with retailers that offer returns with free shipping. Amazon.com's fashion department - Prime offers free shipping and free returns. Prime Wardrobe also allows you to try on items for 7 days free. Target.com, HM.com/en_us, OldNavy.com - All these popular retailers offer free returns (Old Navy pays return shipping. Target and H&M offer free returns in-store). If you want me to do all the shopping for you, you’ll love the complete Outfit Guide. It gives you access to a very comprehensive Shopping Guide with tons of links for each item ranging from Amazon to Target to H&M. Also includes plus size and maternity/nursing shopping links so that you can use this as a maternity capsule wardrobe too. For this comprehensive shopping guide with hundreds of links grab our complete Outfit Guide that corresponds with our capsule plan for moms. My favorite aspect of the capsule wardrobe plan is that it’s designed with “remixable” in mind. That means when you follow the recommendations for what to get in neutral versus color or in pattern versus solid print, your pieces will mix and match into hundreds of unique on-the-go outfits! Premade, ready to buy capsule wardrobe upgrade showing you hundreds of cute outfits for moms.